Enterprize Wharf (also called Enterprize Landing) is the birthplace of Melbourne, when on Sunday 30th August 1835, settlers on the tall ship schooner Enterprize docked on this spot, thereby 'founding' Melbourne. On the landing are 5 statue figures staring out across the Yarra River turning basin along with a plaque commemorating the landing. The people came from Launceston in Van Diemens Land, and they were after land for grazing sheep. They were led by John Lancey, who was put in that position by John Pascoe Fawkner. Fawkner owned the boat, but did not sail on its first trip into the Port Phillip District because he was forced behind by creditors. They picked the site because there was a small waterfall, or rapids, that stopped further progress up the river. The waterfall also separated the tidal movement from fresh water at that site. The waterfall had previously been found and noted by the Colony of New South Wales' surveyor, Charles Grimes, in 1803. This image belongs to the travel and nature stock photo library. 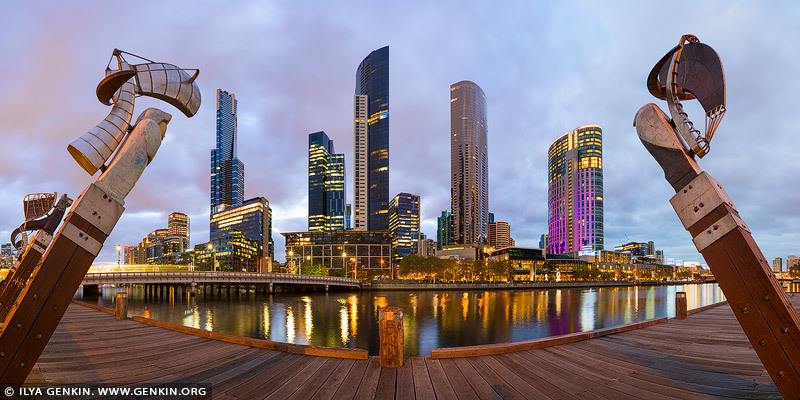 This stock photo of Enterprize Landing and Southbank at Sunset is available for licensing for commercial and editorial uses including websites, blogs, books, magazines, brochures and advertising. Restrictions may apply for images which contain third party copyrighted material or sensitive subjects. Photos of artwork are for editorial use only. This image id AU-MELBOURNE-0011 of Enterprize Landing and Southbank at Sunset, is copyrighted © by Ilya Genkin. This is not a public domain image.